...he has “created a new way for users to interface with a very dry and old fashioned spreadsheet type application,” says Consultant and Engineer Gladstone. iSplit Divorce, already enjoying popularity since its introduction in September 2012, was the launchpad for APG Mobile Applications new App, iSplit Divorce Pro now in Apple’s App Store. Using its revolutionary “visual computing” interface, iSplit Divorce Pro uses icons and the “drag and drop” features of tablet computers to help with reduce the pain and increase the efficiency of the process of splitting up assets and debts. iSplit Divorce Pro is a completely redesigned App (iPad) created with the legal professional in mind. In development for two solid months, “Pro” promises to help lawyers get out from behind their desks and actually work with their clients in a collaborative way. This is one of the new trends in Family Law: a collaborative approach. 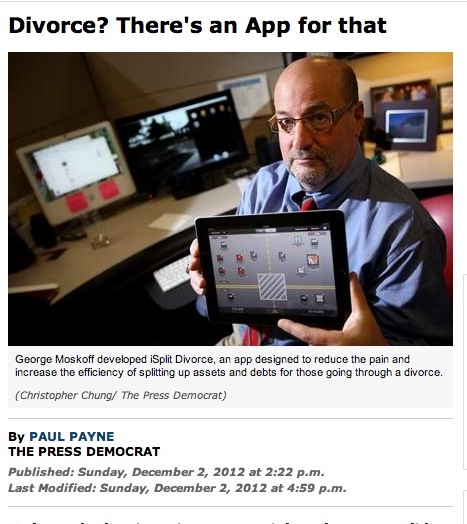 Founder and Chief Innovation Officer, George Moskoff, says: “People going through a divorce need the kind of support and assurance that a good attorney can provide; the good ones make you feel more confident about your prospects.” That’s why iSplit Divorce Pro will have such an impact, he says, because it allows the attorney to actually work with the client...on the other side of the desk. Moskoff, a Brooklyn-born inventor, business consultant and entrepreneur could see the opportunity while going through is own marriage’s dissolution in 2011. The lack of systems and old paper forms was too slow and abstract for him, he says. What makes iSplit Divorce such a unique product? Moskoff says, “...it’s visually based so it’s easy to see who’s getting what and what it’s all worth...in realtime. It’s the opposite of abstract.” While it reduces confusion and increases the efficiency of decision making, it also reduces the amount of time that attorneys have to spend dealing with the splitting assets/debts process, saving the clients money in professional fees and lawyers headaches. Available since early September 2012, the consumer versions have seen App sales steadily climb: “we’re now supporting customers on five continents,” Moskoff offered. The App for lawyers (Pro) is priced at $19.99 per client with unlimited “configurations” or scenarios available for each client. All data from these “distributions” can be output to a spreadsheet or proprietary file and are completely secure: the App doesn’t talk to any other systems or get data from any sources, such as Facebook or GPS, so the data is kept safe. No data is collected from the user, either. Prospects for sales are good, says Moskoff: “For for the week ending November 9th, downloads of iSplit Divorce were up 683% over the previous week...so there is momentum.” Moskoff hopes the Pro version will be attractive, too. For the consumer, there are three versions: Lite; Standard, and; Premium. iSplitLite is free. The Standard version is $9.99 and premium checks in at $14.99. The high end version offers all the bells and whistles the bells and whistles the company has created so far. Using a new technology called “visual computing,” Moskoff has, according to Jerry Gladstone, Founder and First Executive Director of Sonoma Mountain Business Cluster (the current home of APG Mobile Apps). “created a new way for users to interface with a very dry and old fashioned spreadsheet type application,” says Consultant and Engineer Gladstone. iSplit Divorce, iSplitLite, iSplit Divorce Pro, Kids Self Evaluate are products of APG Mobile Applications (http://apgmobileapps.com), the nation’s leader in visual computing for mobile devices. The company is headquartered at the NorthBay iHub Tech Incubator at the Sonoma Mountain Business Cluster in Rohnert Park, California. APG Mobile Apps supports customers on five continents with their leading-edge products. APG Mobile Apps Founder and CIO Showing iSplit Divorce iSplit Divorce Main ScreenDrag and drop icons as you work to answer "what if" and calculations are automatic. Table / Spreadsheet ViewModify all elements in spreadsheet mode. Add ConfigurationAdd a scenario and save the particulars.